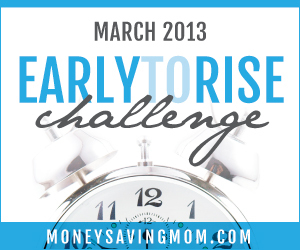 This is Day 29 of the Money Saving Mom Early to Rise Challenge! This is a busy week at our house and I'm excited to share some of it with you later today! For now, we'll just get on to the passage for today. It was a great reminder for my type A self to not pressure myself so much. I really love that the passages are real. Today we covered how not every morning will be amazing, yield massive progress, etc. Worrying about the older two getting up too early is no longer an issue since they discovered they like their sleep and have to grudgingly get up at 6:30 am every morning. Now it's D-baby that I'm dealing with. Lately he's not too much of a morning intruder, but I really did struggle when he would wake up around 5:30 am too. 5:30 was NOT a time I wanted to allow a 1 year old to get up and start the day. I've had to remember not to beat myself up for it too much and have actually had to deal with feelings of inadequacy because I wasn't able to get to everything I wanted to. Usually I bite off way more than I can chew anyway. Another habit I need to get rid of. 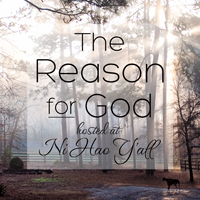 How do you deal with unexpected interruptions, either during your quiet time in the morning or other times of the day? So what time did I get up this morning? I was up by 5:04 am and was able to start on my new challenge for the month of May. I'll share more later today. I'm very excited to pursue another challenge and really hope it will be as beneficial as this one was. Thank you so much for sticking with me through this challenge! One more day, one more day! The Elusive Day 7 Update!